Music notation is a map providing points of orientation that allow players to walk the interpretative walk, their idea of how a piece might journey through time corresponding – hopefully – with composer’s own. 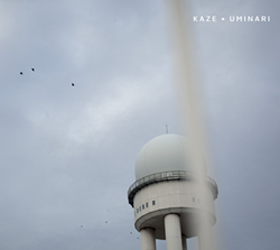 But Kaze’s new work appears to throw up precisely the opposite interpretative approach: The composers here specify notes and chords and ally them to a time frame in which they can be placed; but the actual sounds to be used and their ultimate duration are left to the performer’s discretion. 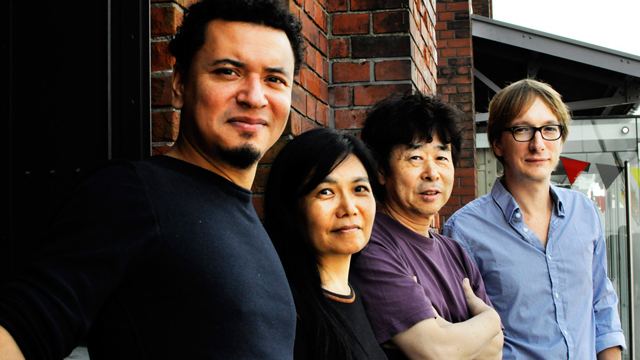 Few performers of today’s avant-garde compositions show sounder judgement and greater acumen than the pianist Satoko Fujii, trumpeters Natsuki Tamura and Christian Provost and drummer Peter Orins – the members of Kaze – whose compositions and interpretations of them on record are always conceived thoughtfully and executed deftly. “Inspiration” for example challenges its performers to keep four separate strata evolving concurrently – no easy task for two trumpets, one piano and one set of drums. So Satoko Fujii takes her time. From the margins of audibility, the first sound you hear is gently fluttering harmonic mist of massaged piano keys which fade back into silence. And taking her time allows Satoko Fujii to signpost the characteristic sonic traits of the other three parts – the trumpets – clearly: ‘noise’ sounds derived from the body of the instrument, individual notes have been prepared with drums and the other trumpet and notes struck in the conventional way, fingers against keyboard. ‘Anarchic harmony’ might easily be Satoko Fujii’s or Natsuki Tamura’s way of describing the randomised layering that results as the number of pieces run their predictable course; but Ms. Fujii’s sensitivity for shape-shifting sound around an emerging structure, her intuition for when new sounds should be triggered while others decay, demonstrates the responsibility that comes with open-form freedom. “Uminari”, Japanese for a sound rising from the sea, a low-frequency roar that portends a coming storm or tsunami maroons erratic, sporadic and volatile sound events inside sanctuaries of silence and once again Satoko Fujii Natsuki Tamura, Christian Provost and Peter Orins have thought each sound through, whether it be conventionally played notes, or – in the case of Ms. Fujii – a punched cluster of notes that seem to come from inside the piano made to sing via a sustaining device. Anarchy of the sea must never be mistaken for misanthropic chaos. This is an album to die for.